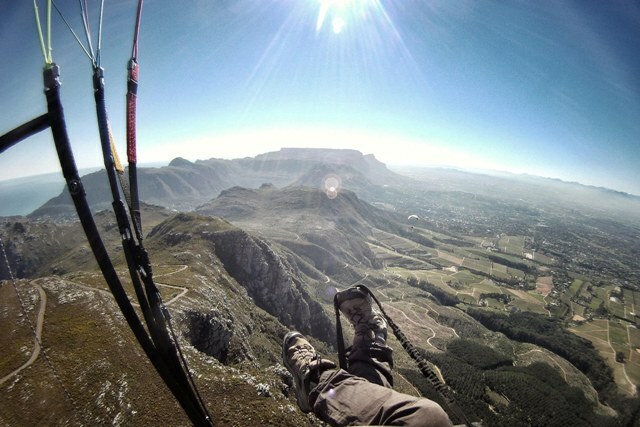 How & When to paraglide from Lions Head. Lion’s Head is a mountain in Cape Town, South Africa, between Table Mountain and Signal Hill. Lion’s Head peaks at 669 meters (2,195 ft) above sea level. The peak forms part of a dramatic backdrop to the city of Cape Town and is part of the Table Mountain National Park. Description: Home of the Glen Paragliding Club, a consistent and beautiful site to fly, offering a panorama of Camps Bay and the Twelve Apostles. In the afternoon, Lions Head heats up and generates a thermic, upslope breeze. Parking is on the back (Capetown side) of Lions Head, then a stiff hike is required up the gravel road and around to the front side. Because of the spire-shape of the peak, the wind diverges around it, causing a strong increase in wind speed at both takeoff sites when it is soarable. The wind is usually crossed from the left (S) at the top site and very strong, and crossed from the right (NW) at the lower site. Dont pioneer a new launch site somewhere else on the mountain. Now I will try to explain in what type of weather conditions you can paraglide from Lions Head. The South Easterly wind is a low-level wind with a reverse wind gradient (stronger on the ground and weaker in altitude). We get the formation of a Wind Shadow mostly in the warmest parts of our weather season but it is possible in the middle of Winter as well. The red lines indicate the direction of the airflow of the Southeasterly wind. As mentioned before the South Easterly wind is a low-level wind and is prevented/blocked from flowing over Lions Head by Table Mountain. The yellow area is where the wind shadow generally sets up. Looking out towards the ocean from Lions Head a distinct line can be seen on the ocean with a slight difference in colour indicating the presence of a wind shadow. The white cloud that starts to form between Devils Peak and Maclears Beacon on the left and Llandudno and Judas Peak to the right now indicates that there is an increase in the strength of the southeasterly wind. The cold South Easter flowing from False bay starts to condensate as it gets pushed up against the back of Table Mountain. The size of the flyable area in yellow now starts to decrease and whitecaps / white horses can often be seen outside of the yellow area. 3) Whitecaps on the ocean outside of the wind shadow. The increase of the white cloud indicates that the wind shadow is now almost broken down and it is no longer safe to continue flying. The decrease of the wind shadow size can be seen in the yellow circle. The distinct wind shadow line is now moving closer to the landing area. All flying should now be stopped and you should go land at the designated landing areas as soon as possible. The wind shadow is now completely broken down. If you find yourself still in the air, then you are lucky! The safest place for you to land is BACK ON THE MOUNTAIN IN THE YELLOW AREA. In Part 2 we will look at flying in a Southerly wind. In this part I will discuss how to paraglide in the Southerly wind, please feel free to post any comments or questions. 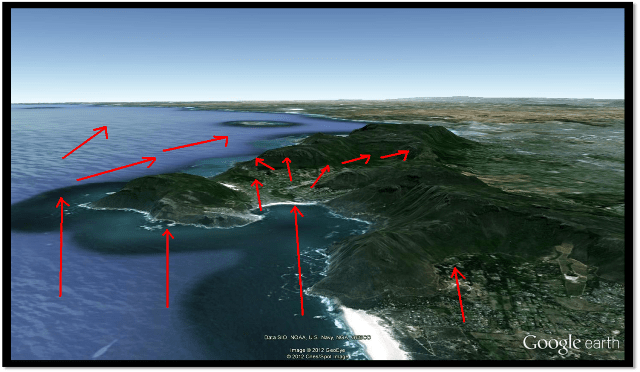 The picture below shows the Southerly airflow from Hout bay. The “wraparound” southerly can clearly be seen with the change in wind direction as the air flows around Karbonkelberg and into Campsbay towards Lions Head. The Southerly wind now presents itself as SSW at the landing field in Campsbay. The first thing I would do is to check all the relevant Iweathar stations to see if the predicted Southerly wind is indeed South. If the wind is stronger : DO NOT PARAGLIDE ! This picture shows the general Southerly airflow in light winds. If the wind on the top take off is not stronger than 20km/h you can paraglide in all areas on the mountain. The yellow circles are the areas that generally work well to get to the top of mountain. The purple areas now become areas of danger and should be avoided at all cost. Due the the shape of Lions Head, the wind accelerates on the sides of the mountain creating a dangerous “venturi” effect. If you find yourself stuck in the strong wind just below the top take off, try to use the ridge to climb as much as possible, if you can climb then make a wide right turn away from the ridge and run for the Sea Point promenade. The small yellow circle on the picture below is the Bottom take off. If you are standing on the Bottom take off facing the ocean, you will see that there is a spine running down the mountain towards the Camps Bay High School sports field. If you are unable to get up, follow the route marked with the yellow arrows. This is the windward side of the spine. The lee side of the spine is often a little turbulent and chances are good that you will get flushed here. The yellow arrows indicates the best line to take when flying out towards landing. The wind is often stronger on the landing field, always approach from the upwind side and then drift back to land in the field. We often experience some strange convergence that sets up just above the Camps Bay High School field. The yellow area is where you would find this convergence line, dont be frightened by this. Try to avoid the blue area just above Clifton 4th beach as this area is often very turbulent. The convergence usually sets up just before it blows out, so keep your eyes on the ocean for signs of increasing wind. If you see white horses / whitecaps it is time to go land. In the next part I will discuss flying Lions Head in a South Westerly wind. Do South Africa Travel Online offer any services whatsoever that may benefit clients of Fly Cape Town Paragliding?! Ill answer that question, but before I do that, I must recognise that if youre anything like me you wont read to the end of this article  to ensure you dont lose out Ill let you know right from the start that I have a little gift that Im giving away at the end of this article to Fly Cape Town Paragliding readers. Now that weve got the bribes formalities out of the way, a bit of background:South Africa.TO is an online travel agency started in 2006 by Rob and Karen Baker. It specialises in helping people book Cruises in Cape Town and Durban, cheap flights, car hire and travel-related services to customers all over the world, and has a newsletter it sends out on weekdays which includes travel specials and news. Its one of the worst kept secrets in the travel industry that much of the South Africa.TO website is written by its clients  South Africa Travel Online give away travel vouchers for any reviews sent in. So after your paragliding jump, email a review of your flight to cheapflights@southafrica.to– be sure to include photos and send that crazy video of yours via Dropbox (the more and better quality material you send the more vouchers you get). Travel vouchers can be used for flights, car hire and cruise bookings. On the website you can contrast airline flight prices, and easily identify and book the cheapest flight to Cape Town. Now, in my experience, most people are willing to walk over hot coals to book a cheap flight, but they dont spend half as much time comparing car rentals  the Cape Town car hire comparison tool makes it easy to find the cheapest car rentals. Did you know that South Africa Travel Online sells the most South African cruises every year of any South African-owned travel agency?Perhaps whilst paragliding high above Signal Hill and Lions Head you spotted a cruise ship in Table Bay Harbour  the MSC Sinfonia, MSC Opera and RMS St Helena cruise ships are all regular visitors to the Cape.Cape Town cruises allow one to see the views that the first European settlers in South Africa experienced when the Dromedaris entered Table Bay Harbour in April 1652, and to feel the waves moving the ship about in the seas that were originally named The Cape of Storms. Of course later the Cape was renamed The Cape of Good Hope, but the seas dont know that, and cruises from Cape Town typically start a bit later in the summer than cruises from Durban, to try avoid Harbour closures due to the Cape Doctor (as the South-Easter prevailing wind is named) blowing a bit too hard. Combine Cape Town cruises with a visit to Namibia, where you can see the newly renamed town Namibia (previously called Lüderitz) and the nearby abandoned diamond town of Kolmanskop which the Namib desert is slowly reclaiming. Or perhaps you want to cruise a little further north and visit Walvis Bay, where you can go quad-biking & sand-boarding in the dunes (you havent truly visited Namibia if you havent felt its sand in your hair! ), and perhaps head a little further north to see the quaint little German seaside resort town of Swakopmund. Contact a South Africa.TO travel consultant to find out what Cape Town cruises are on offer. Hint : there are ALWAYS Cape Town cruises deals on offer  from early bird specials, to seniors specials, honeymoon specials & even sometimes buy-1-get-1-frees. And as a special deal to readers, South Africa.TO are throwing in R500 onboard credit per cabin booked for cruises from Cape Town to Southampton to those who package a paragliding flight in with it(cannot be combined with other South Africa.TO specials). Simply email cruises@southafrica.to saying that you want to book the paragliding flight + Southampton cruise package.